The prize giving ceremony of “Independence Day Essay Contest 2019” was held on 07 April 2019 at 12:00 pm in the Digital Classroom of DT. Honorable Vice Chancellor of DIU Professor Dr. Yousuf Mahbubul Islam handed over the prizes among the winners. Professor Dr. Golam Mowla Choudhury, Controller of Examination of DIU, Professor A. M.M. Hamidur Rahman, Dean of FHSS, Mr. Md. Rakibul Hasan Khan, Head of the Department of English, and Dr. Milan Khan, Librarian of DIU were present in the occasion along with other teachers and students. The Department of English of DIU has organized this essay contest with the sponsorship of prize money (1st 5000 + 2nd 3000 + 3rd 2000 = BDT 10000) by Professor Ronny Noor, Professor of English at the University of Texas Rio Grande Valley, the USA. Professor Noor visited the Department of English in last December and made this proposal of arranging such a competition among the students of DIU to inspire them to write critical essays so that they can engage in positive activities. The Department of English warmly accepted the proposal and got formal approval and necessary support from the university authorities. The main objective of this contest was to inspire students to think critically and transform their thoughts in writing. This event created a new dimension to different ongoing co-curricular activities run by the Department of English. The contest started in January 2019 when a call for submission of essays was circulated among all the students of DIU. The topic of the essay was “How Education Can Contribute to Social Peace”. Students were asked to submit an essay of around 2000 to 2500 words by 20 March 2019. Total 43 essays were submitted, out of which 16 essays passed the plagiarism test. Those 16 essays went through three fold evaluation process judged by the teachers of the Department of English. Finally the following three winners were declared and awarded in the prize giving ceremony: (i) First Prize: Md. 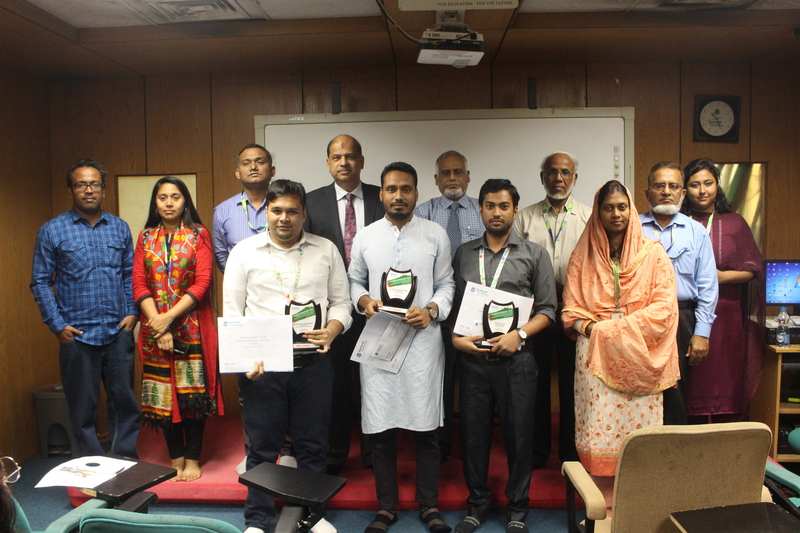 Masud Parvez Rubel (Department of English), (ii) Second Prize: Zahirul Islam (Department of Englsih), and (iii) Third Prize: Nazmus Saqueeb Ashrafi (Department of Business Administration). Along with the cash prize, each of the winners have received a crest and certificate.